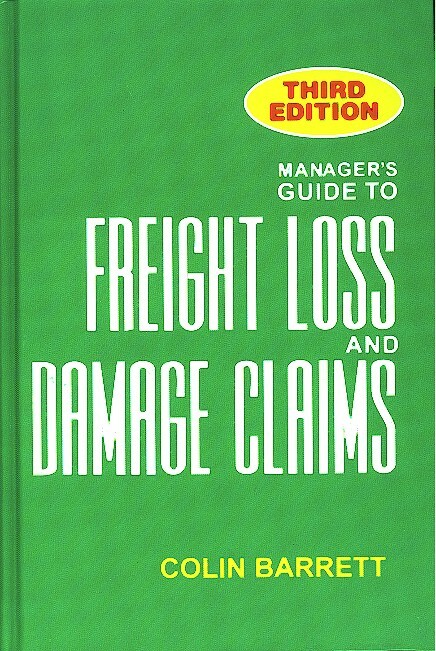 Like the first and second editions, a real-world, practical approach on how to deal with the twin problems of freight damage and freight loss. Author Colin Barrett discusses both the law and the reality of freight claims--understandably and succinctly--so that shippers and carriers alike can understand their rights and their responsibilities in dealing with loss and damage problems. In this new and expanded edition, Barrett has updated key areas in accordance with changes in the law and court decisions, and has added a wealth of further information. Written in clear, descriptive language; the plentiful legal references appear as footnotes. The meat of the book is easy to get to, and the footnotes are there when you need them. Too often legal discussions seem to be (to coin a phrase) of the lawyers, by the lawyers andmost regrettable of allfor the lawyers. Even those that purport to be in plain English wind up so riddled with legalistic phrasings and case citations that the lay reader is soon gasping with the effort to keep up. The law is important to everyone. And understanding the law is important to everyone. This book can help promote that understanding. When I wrote the first edition of this book ten years ago my goal was to put together a basic text to help managers in the field work with the claims they file and receive. I wasn't trying to prepare a legal tome so replete with Latin phrases and court citations that technicalities of the law obscured underlying principles, of greatest value (and often only comprehensible) to lawyers; it was meant, as the title says, to be a practical guide primarily for the non-attorney manager. That's still my objective. But on reflection I think that in the earlier edition I may have gone too far stripping away the legal nuts and bolts. After all, the ultimate arbiter of the rights of claimants and carriers alike is the law, and at least some degree of legal understanding is necessary in this discipline (as, for that matter, in most others; ignorance of the law, as has been written, is no excuse for not abiding by it). So in this new edition I've backed away somewhat from my previous reluctance to burden the reader with citations of statutory and case law. I still try to explain matters in plain terms, using legal jargon only where absolutely necessary and clarifying its meaning when I have to use it. And I've confined legal citations to footnotes, where they don't clutter up the landscape so much and make the reader work harder to extract meaning from the text. But I don't feel I should ask readers to simply take my word, as a so-called expert in the field, for what I'm saying; this time around I've added many more citations to document the legal authority for my discussion. In addition, although the fundamental law of freight loss and damage claims has been fixed for hundreds of years, as with all things time has introduced refinements and modifications. Technological advances, changes in societal standards and in legislative and judicial philosophy, alterations in commercial practices, etc., all have contributed and continue to contribute to development of legal standards. The past decade has proved no exception, and in some areas what is now statutorily mandated and/or judicially accepted differs sharply from 10 years ago. Where that's happened, or new laws and rulings have altered basic precepts, I've made appropriate revisions to reflect the current state of the art. No text, however comprehensive it attempts to be, can cover all possible variations on L&D claims. Over the 27 years I've written the Questions & Answers column in Traffic World magazine I've received more questions about this than any other single subject, many have involved factual circumstances for which no exact parallel exists in the case law, and each passing year brings me more of the same. Ultimately, resolution of each claim must depend on its unique set of facts. But those facts must be evaluated in an established legal context, which is what this book is about. As I wrote in the foreword to the earlier edition, the law is important to everyoneQ.E.D., understanding the law is important to everyone. I hope my efforts here help promote that understanding.